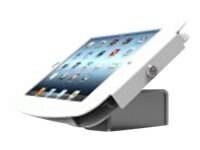 The two part rectangular base can be mounted gracefully and steadily on any counter top, wall or flat surface. The cubed base allows for cable management and security, and it fits over most power outlets with a 3.6 x 2 inch cutout. The base and enclosure have keyed locks for easy access to the wires and to the when maintenance is required.